What Are The 12 Tribes of Israel From The Bible? The 12 tribes of Israel are named for the 12 sons of Jacob. God changed Jacob’s name to Israel later in his life. Each son became the patriarch for the 12 tribes found in the Bible. The story of the wives and sons of Jacob take up a good portion of the book of Genesis. Jacob ran away from his twin brother Esau and fled to the land where his mother was from. Jacob met his uncle Laban and fell in love with Laban’s daughter Rachel. Through a little underhanded dealing by the hand of Laban—which Jacob was used to giving out to others—Jacob ended up with two wives. He married Rachel and her older sister Leah. Jacob also fathered children by the servants of his two wives. The 12 tribes of Israel are named for the 12 sons of Jacob. God changed Jacob’s name to Israel later in his life. Here is the list of the sons of Jacob and their mothers. The number in parenthesis after the name is the order in which they were born. Genesis 49 gives a list of the sons of Jacob along with a prophesy of each one. Listed below are the names of the 12 tribes and a little about each one. Reuben chose not to reside in the Promised Land after the Israelites finally entered. They asked Moses for a tract of land on the east side of Jordan. Moses granted their request on the condition that they would help conquer the land for the rest of the nation. Though they were obedient in that, they were not overly helpful in some of the later wars that Israel fought. Not much is said about them after they took possession of the land. Simeon and Levi joined forces to kill the men of an entire city for defiling their sister Dinah. That story is told in Genesis 34. Their land was situated within the land of Judah and they were later scattered to other areas of Israel. Along with Simeon, Levi took part in the slaughter of the men in Shechem’s city. Later in their history they stood with Moses against the children of Israel when the people made and worshiped the golden calf. 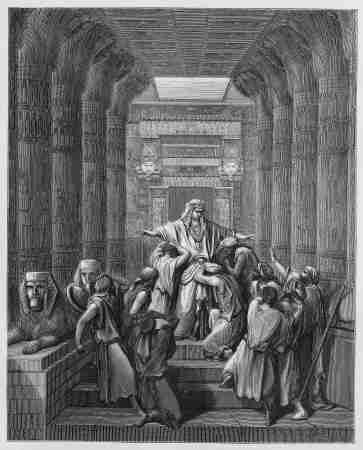 The men of the tribe of Levi were ministers in the Temple, but had no land of their own. The book of Leviticus speaks extensively of their duties to the nation and to God. Moses and Aaron were from the tribe of Levi. Judah, as a tribe, is mentioned often in the Bible. Their land included the city of Jerusalem. The southern tribes of Israel are referred to later in the Bible as simply Judah. King David, Solomon, Mary and Jesus Christ are all from the tribe of Judah. Sadly, the tribe of Dan did not follow the plan of God in securing their portion of the Promised Land. They are often seen defying God and His people. They wandered away from their plot of land and later turned to idolatry. Samson is from the tribe of Dan. A significant prophecy in Isaiah 9 was given to Naphtali and Zebulun. This prophecy was that the promised Messiah would dwell in their land. In the land of Naphtali is the region of Galilee where Jesus spent much of His ministry. Not much is mentioned about Gad as a tribe. They settled to the east of the Jordan river with Reuben. Asher possessed the land farther west in Galilee from Naphtali. It is a region well-known for its olive groves. This fits well with the prophecy of Jacob which says that they would yield royal dainties. Not much is known about the tribe of Issachar, but significantly, they stood behind the judges Deborah and Barak. They apparently were wise men who gave counsel to the government of Israel (1 Chronicles 12:32). The tribe of Zebulun made up a significant portion of the military of King David. They were strong and loyal to David and to the judges who came before him. Joseph’s land was divided by his two sons Manasseh and Ephraim. Even though Joseph’s tribe and land was divided, he was given a double portion of everything. Often in the listing of the children of Israel, Joseph’s name is missing. But the names of his two son’s are listed in his place. Manasseh settled on both sides of the Jordan river. When the Bible talks about the “half tribe of Manasseh” it is referring to the half which dwelt on the east side of the river. Ephraim, though he was younger than Manasseh, received the blessing from their grandfather Jacob as if he were the firstborn. Joshua and Samuel are descendants of Ephraim. King Saul and Paul the Apostle are from the tribe of Benjamin. Though they were small in land mass, they stood against Israel in a civil war in Judges 20 and 21. I trust this is a good introduction to the tribes of Israel. When the Promised Land was divided there was no land given to Levi. Joseph did not receive land in his name either, but it was divided among his two son’s Manasseh and Ephraim. That is important to note when trying to figure out who the 12 tribes of Israel are and how they fit into the division of the land of Israel. Another Reading: How Did The 12 Apostles Die? Hello, David! 😀 I seek not to divide anyone over this, but why are the Matthew and Mark accounts of the “greatest in heaven” debacle different? According to Matthew, the disciples simply asked Jesus who would be the greatest in Heaven, and Jesus rebuked them by setting a child in their midst. But according to Mark, the disciples were ARGUING who was greatest, Jesus asked what they were arguing about, and they stayed silent out of shame. Then Jesus set the child in their midst. Which one should I believe? Do I believe both of them? Which testimony is correct? I apologise for putting this burden on you.